1 of 3 In a medium-size saucepan, stir together tomatoes, vinegar, brown sugar, onion, 1 teaspoon of the salt, 1 teaspoon of the ground ginger and 1/2 teaspoon of cumin. Bring to a boil over high heat. Boil for 18 to 22 minutes, stirring occasionally, or until the liquid has cooked off; set aside and keep warm. 2 of 3 Meanwhile, place vegetable oil, remaining 3 teaspoons ground ginger, 1 teaspoon cumin, the coriander and cayenne in a shallow glass dish; stir to combine. Place chicken in the mixture and turn to coat. 3 of 3 Heat gas grill to medium-high or prepare charcoal grill with medium-hot coals. Sprinkle chicken with remaining 1/2 teaspoon salt and grill for about 7 minutes per side or until internal temperature registers 160 degrees on an instant-read thermometer. 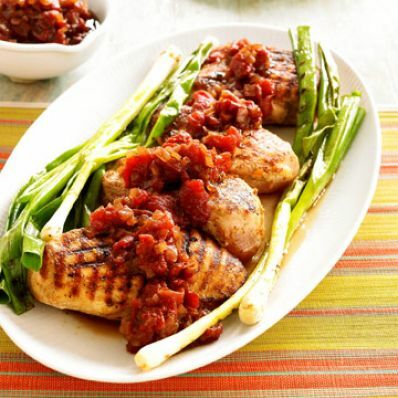 Serve chicken with a heaping 1/4 cup chutney. Per Serving: 42 g pro., 425 kcal cal., 1017 mg sodium, 4 g fiber, 1 g sat. fat, 99 mg chol., 10 g Fat, total, 44 g carb.